The 14th Engineers was a unit that deployed with "old" weapons. If you scroll up a little bit to where I put our unit history you will see that when we were shipped to England, we were issued the 1889 trapdoor and the 1896 Krag. The one in Cache, OK hasn't been seen in a long time, but is supposed to still be there. The owner of the park passed a few years back, and the last I heard that place is still in limbo. I have been unable to confirm if the 0-8-0 there actually ever operated there. I also heard that there was a fire at the amusement park site a few years ago. Alright, today must be trench railway day, because I keep finding things regarding the trench lines even when I'm not looking (although I did do some looking today). This is a short documentary I found on youtube a few minutes ago regarding military railroads in France during WWI. I'm trying to find information on one that was based at Ft Eustis VA in the early 1900's. I've got one photograph showing what is current day Hanks Yard, and one side is standard gauge, while the other is a mirror image using 24" trackage. The yard appears to be an assimbly line for the standard gauge, however I have seen a map (1926) of the base showing a "narrow gauge" shell desposal line running from Hanks yard down along the James River and out into an area that to this day is still off limits. The line was being used to remove ordance that was fired upon the base from Camp Wallace. I've yet to find any other information as to what else the line may have been used for. There was also a lumber spur listed on the map but im not sure what gauge that was. Also there is rumored to be two locomotives, narrow gauge 0-4-0's out in the mud along the river somewhere, however i've never seen them, nor has anyone else i've spoken with over the last 10 years. Can you post the picture? I am aware of a 2' at an arsinal in AL, but have never seen anything on one at Eustis. I'll ask a contact I have there at the transportation Museum. The image is from the transportation museum and I was told not to repost it anywhere. From the looks of it in the image it was being used only as an assembly line for standard gauge equipment, but then come the story of the shell disposal line and a map to back that up. Well I can tell you that none of the 2-6-2 or the infernal combustion (Gas mechanical) locos built for war service buit by Baldwin, Davenport, Vulcan, Plymouth or Witcomb were ever there. I'm not showing any disposition reports from the War Department of anything there durring WWI (or shortly there after). That being said, that doesn't mean that there was nothing there. If for some reason that test railroad had been "classified" we wouldn't see too much on it. Without being able to see the picture, I would say ask the Transportation musem. They should have info on it, as the records there are very complete for stuff at Eustis. "Number 1902 locomotive that helped haul Fort Benning Soldiers from classrooms to firing ranges between 1919 & 1946 has found it's new home on the grounds of the National Infantry Museum and Soldier Center! This afternoon a WWII Half Track Personnel Carrier M-3, an M-59 Armored Personnel Carrier and a Bradley M2 Infantry Fighting Vehicle will also be placed behind the museum near the stadium. Check back later today for more photos and history about these amazing additions to the museum!" They have it decked out in a flat brown (and it doesn't look to shabby for that). Paint color is not correct, but oh well. It should have been painted either a field grey or black. At least it's been painted. It had been neglected for quite a few years. It figures the engine would be moved to the new museum just now. My Dad and I went there when I was in the region in September and it wasn't there at that time (the museum overall was a disappointment in that all of the best stuff that was in the old museum is now in storage, the museum is more about 'telling a story' then it is about showing the collection of artificats). I'm glad that it's finally got some TLC. Still in the wrong paint, but oh well. The army museum system is famous for being farbs. Now, if only I could find what I saw the other day. . .
Just ran into this photo showing a shop locomotive pulling a car built for WW1 export. 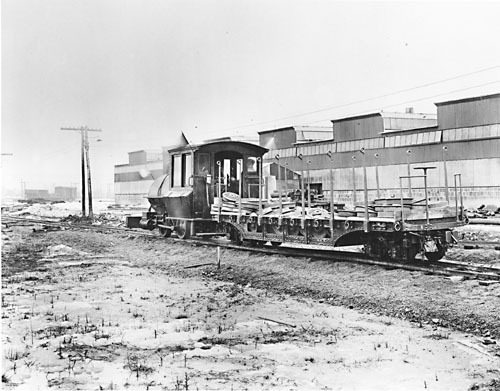 This was in Canada at the National Steel Car Corporation Ltd.
Un-identified narrow gauge 0-4-0T, used to handle equipment built in WWI for the British Army.